About Us | George Witt Service, Inc.
We’ve been family owned and respected in Lincoln for 22 years. We’ve elected to become the best we can be by focusing on only 2 manufacturers of vehicles. This allows us the resources to use Honda and Toyota factory test equipment, service information and factory quality parts. We are a team of auto repair professionals who are passionate about providing a great customer service experience. 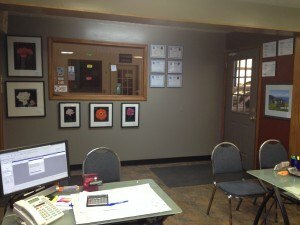 Our clean, redecorated office and clean auto repair shop shows our pride in our work, as well as helps insure your car will be free of spots when it’s returned to you. 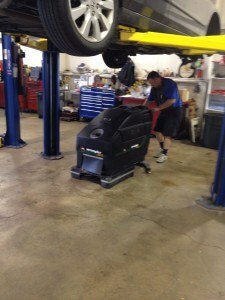 We often clean our bays in between jobs, using our shop “zamboni”. Personal, caring auto service isn’t a phrase here, it’s our way of life. Your car isn’t done until our experienced techs are satisfied that every last detail is just right. Our office staff even goes so far as to get all the parts ready for your repair visit when you make your service appointment. This allows us to be efficient and increase the quality of your auto repairs, while reducing the time your vehicle is in our shop for auto service. Our team believes strongly in our community, as well. Read about our Community Service here. We believe in giving back. Call us today or use our Contact us form or just drop in for a quick tour and a free soda. Let us show you why more and more happy Honda and Toyota owners are becoming George Witt Service customers.